Could Modern Medicine Have Saved Bo Jackson's Career? 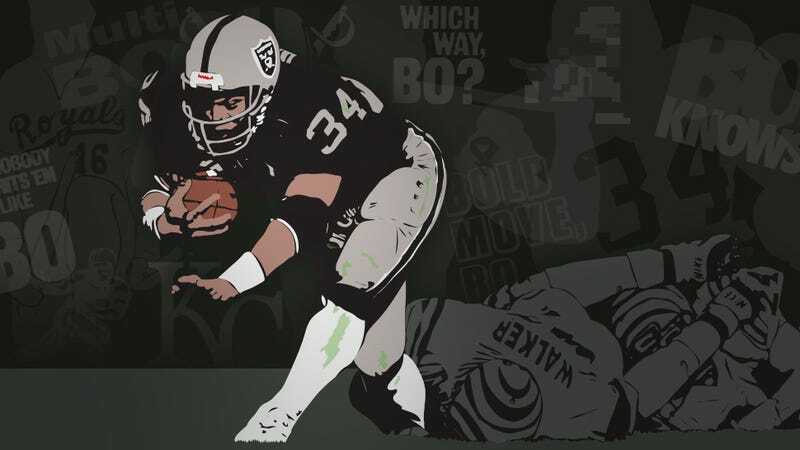 I was too young to remember watching him play, but the unifying tone of wonderment emanating from anyone who saw Bo Jackson crack a 500-foot home run or bulldoze an obnoxious Brian Bosworth into traction has never washed with the plainness of the injury that ended his career. It doesn't make sense. The impossible Bo Jackson just fell down and couldn't play football anymore. How does that happen? And could today's medicine have done anything differently? Bo's transcendent career was cut short in January 1991, when an awkward but unremarkable-looking tackle injured his hip, leading to a hip replacement and his retirement. The injury is often described as a dislocation which, unsurprisingly, oversimplifies the medical facts. So let's look a little deeper. The first thing to understand is that a lot of things went into Bo's injury. The hip dislocation itself is what happened on the field, but it isn't what forced Jackson into retirement. That would be a bone disease called avascular necrosis (AVN), which happens when blood supply to the bone is disrupted, as it was with Jackson. From there, the ball of his hip literally died and needed to be replaced. If he were playing today, maybe that doesn't happen, maybe imaging technology spots the complications before they get that far—or maybe it doesn't. We're getting ahead of ourselves, though. Let's start with how the hip actually works. Hips are synovial ball-and-socket joints, with the head of the femur, or thigh bone, forming the ball and the acetabulum (a bony structure formed by the fusion of three pelvic bones) forming the socket. The bony surfaces of all involved are covered by articular cartilage, which helps facilitate movement. Structures boxed in red are important and in italics below. Left: Acetabulum and side view. Middle: Upper portion of the femur. Right: Image of the femur and acetabulum articulation with the capsular ligament removed. This arrangement gives your hip joints their weight-bearing capability and freedom of motion, but it doesn't provide enough stability. It's fairly easy to visualize the potential issues here: with a long bone connected to the ball portion of this joint, too much movement in any one direction will lever the ball right out of the socket—and hip dislocation, being the reason we're here in the first place, is a bad thing. Excessive movements are prevented by the capsule of the hip joint, which surrounds the ball and socket. This capsule is composed of fibrous tissue and has an inner synovial membrane which secretes small amounts of movement-facilitating fluid. The fibrous tissue also includes thickened regions functioning as ligaments. Basically, it's a strong, thick portion of tissue that restricts movement from going too far, and which lubricates itself as necessary. Unlike knees and shoulders, there's still considerable debate about the precise biomechanical workings of the hip. As recently as 2008, scientific literature points out discrepancies in the number of ligaments and their precise functions. While this sounds bizarre (what, you can't just count them? ), it's understandable once you dig a little deeper. These ligaments are indistinct thickenings of the hip capsule rather than differentiated connections. Which is to say, they're just places your hip's tissue has decided to glob together. Recent research has tested what these ligaments do by testing ranges of motion in cadaver samples, cutting one of the ligaments, and then retesting ranges of motion (the related paper included Adam Savage as one of the authors, which is awesome and maybe the only reason it's included).1 But all we really need to know is that the ligaments collectively function to hold the femur head in place through wide ranges of flexion, extension, and rotation. Any tears or stretching of these ligaments can lead to instability and increase the likelihood of traumatic dislocation—which, as we'll see, can come with extreme complications. Strangely, weakening of these ligaments can be a side effect of non-traumatic athletic activity involving repetitive use or incredible flexibility, like golf and ballet. The ligament capsule surrounding the hip joint. Left: A rear view of the right hip showing the capsule as a single, continuous structure. Middle: A front view of the right hip. Right: A rear view of the right hip. That's enough background on bones and ligaments, but we'll need a bit about blood flow to fully explain what goes wrong with hip injuries. There are three vessels of concern here: the foveolar artery and branches of the medial and lateral femoral circumflex arteries. These arteries form anastomoses, or redundant connections, to the head of the femur to supply it with blood. The foveolar artery runs through the femur head's ligament from the socket to the femur, while branches of the two circumflex arteries rise from the deep femoral artery, which runs all the way down your leg, and reach the neck and head of the femur. These are so crucial because even a small disruption in blood flow to a bone can be disastrous—especially somewhere as crucial as the hip. Luckily, the ligaments and architecture of a healthy hip are phenomenally stable. Unless aided by congenital abnormalities or the brittleness of aging, traumatic dislocations are rare. You'll most often see them in car crashes, when a patient's knee is slammed into the dashboard, but you'll also see them with falls from height and football tackles. Yes, medically, football is like a car crash. Football is terrifying. An overview of the vasculature of the femoral head. Left: General diagram showing all relevant arteries boxed in red. Middle: Front view of the right hip. Right: Rear view of the right hip (foveolar artery unlabeled at top). Left image via. Middle and right images via. Back to Bo. It's a little difficult to nail down the precise timeline and nature of his injuries. Bo himself stated that he felt his hip go and then popped it back in. Despite his deserved mythos, that has to be impossible. A human being can't do that with a full-on hip dislocation. It's more likely he felt a partial dislocation (or posterior subluxation) and helped it slide back into place, and the more detailed accounts of the injury seem to back this up. A partial dislocation is exactly what it sounds like: Instead of the head popping entirely out of the socket, the femur head is only partially displaced, resting on the rim of the socket, allowing it to slide back into place on its own. As you can imagine, this isn't a clean or painless process. These partial dislocations often fracture the socket's rim, stretch or tear portions of the hip capsule, and tear the blood vessels supplying blood the femoral head. They're a hurricane in your hip joint, essentially. And worse, these injuries have been often misdiagnosed as strains or sprains, since the spontaneous correction of joint alignment presents as a properly aligned hip. Some victims of this injury, like Bo, can even walk off the field shortly after the trauma. What happens next is crucial—and time-sensitive. First, you need a prompt reduction of the joint, which just means getting it back into place. When out of place, still-intact femoral-supplying blood vessels can be stretched or impinged upon, restricting blood flow. Any disruption in blood flow can start a chain reaction of avascular necrosis (AVN), the bone disease we mentioned earlier, and the likelihood increases greatly when time between injury and reduction passes six hours.2 I'd say Bo was lucky to have such a quick reduction, but as we'll see, his injury was plagued by a nearly perfect storm of complications. Once this process gets rolling, prognosis is poor and it's generally a matter of when the hip will be replaced, not if. AVN is difficult to diagnose early. When Bo's injury occurred in 1991, the possible complications were known, and methods of diagnosing established, but the process was still unrefined. Left: CT showing a dark region of avascular necrosis in a characteristic "crescent-moon" shape (white arrow...don't worry, this wouldn't jump out at me either. Radiologists are very good at their jobs). Right: An MRI showing the same patient's avascular necrosis (white arrow). Images via Mitchell, Kundell, et al. It's difficult to tell which examinations Bo underwent, but it's safe to assume he had unfettered access to imaging procedures. What we do know is that his injury caused disruption of blood flow to his femur and avascular necrosis set in. If Jackson were playing today, that period immediately following his injury is when modern medicine could have possibly prolonged his career. Not even necessarily by wiping out the AVN or by catching it early, but by ensuring it never happened in the first place. Prevention is the first line of defense here. MRIs and angiographs—injections of dye into the vessels followed by X-rays that visualize flow patterns—can demonstrate damage to vital blood vessels before extensive cell death occurs. The last 20 years has seen great strides in imaging quality, allowing analysis of fine structural integrity, and we know about the best timing, types, and views to implement for specific injuries. Immediate X-rays, CTs, and MRIs are necessary for visualizing dislocations or bleeding into the joint, but aren't effective in visualizing AVN until four or six weeks post-injury.3 It appears bone scans may be effective in catching earlier avascular necrosis progression by showing increased uptake of radioisotopes before damage would be visible on MRI. It's as simple as, we know a little more, and our equipment is a lot better. If prevention fails, treatment of AVN focuses on slowing progression of cell death and repairing the bone with minimal damage to its structural integrity. Vascularized bone grafts involve replacing a region of dead bone with healthy bone from another part of the body (usually the fibula, smaller of the two lower leg bones).4 Newly placed bone will fuse with the femur, form connections between graft and femur blood vessels, and halt the AVN cascade without sacrificing stability. The treatment that's the advanced the furthest since Bo's injury may be hip arthroscopy. This is a fairly invasive procedure, as the leg needs to be carefully positioned into traction, with the foot forcibly pulled down until the femur head and the acetabulum gain enough separation for access to the joint. Your leg is literally stretched until surgeons can reach into the separation of your thigh and the hip socket. Again, the timing of this procedure is important. If a patient hasn't shown advanced AVN, it should be held off until the clean MRI at six weeks. That's because the traumatic nature of the procedure can cause developing AVN to get even worse. Arthroscopy can also be used for core decompression for early AVN, removing necrotic regions to facilitate regrowth and healing. But even if caught and treated, the prognosis for avascular necrosis of the hip is poor. Treatment may prolong joint viability, but a hip replacement is in the future. Replacements involve artificial acetabulums and femur heads grafted into the patient's femur and pelvis. Strength and lifespan of replacements are constantly improving, often as a result of new materials. They've developed from the "simple" cobalt-chromium alloys of the past to the ceramic, polyethylene, and zirconia-crystal embedded alumina of today, minimizing both particle-producing wear and fracture propagation. Biomechanical improvements are occurring as well. One elegant adjustment for more athletic patients was to increase the diameter of the graft ball. The larger surface for rotation increases the range of motion possible before risking dislocation.7 Still, it's a far cry from a real, functioning hip for a professional athlete. Pictures via and x-ray via. As the quality and sheer volume of hip replacements have gone up, so too have patient expectations and efforts to return to athletic activities. Recent studies show improvements in surgeon confidence, patient activity, and graft viability. Return to athletic activity is both possible and encouraged. However, "athletic activity" is a limited term. All high-impact sports are strictly discouraged, as even jogging will place loads up to 5.5 times body weight on the replacements.8 Considering the hip, the list of high-impact sports includes baseball, basketball, volleyball, american football, running, soccer, waterskiing, and others.9 So no Bo comeback there, even with the best hip replacement we have today. The best chance today's medical community could have given Bo for a full career would've been the complete prevention of avascular necrosis through improved imaging techniques and injury management. Our understanding of traumatic hip injuries has improved dramatically since Bo Jackson's retirement, and so has the treatment. But it's likely his prognosis would only be slightly improved today. His treatment was almost certainly thorough and prompt, and we can assume his avascular necrosis was diagnosed quickly. Medical opinion on progressive AVN is unchanged over the decades: Don't ever play football again. Bo Jackson's hip was a ticking time bomb of decay. Not even he could play NFL football on one of those. Jesse Fredeen is a medical student, and a regular contributor to Regressing. Martin H, Savage A, Braly B, et al. The Function of the Hip Capsular Ligaments: A Quantitative Report. Arthroscopy: The Journal of Arthroscopy and Related Surgery, 2008; 24:188-195. Foulk D, Mullis B. Hip dislocation: evaluation and management. J Am Acad Orthop Surg, 2010; 18:199-209. Moorman III C, Warren R, Hershman E, et al. Traumatic Posterior Hip Subluxation In American Football. The Journal Of Bone & Joint Surgery, 2003; 85A:1190-1196. Thompson G, Chin K, Son-Hing J. Close Bone Graft Epiphysiodesis for Avascular Necrosis of the Capital Femoral Epiphysis. Clin Orthop Relat Res, 2013; 471:2199-2205. Mitchell M, Kundel H, Steinberg M, et al. Acascular Necrosis of the Hip: Comparison of MR, CT, and Scintigraphy. AJR, 1986; 147:67-71. Shindle M, Domb B, Kelly B. Hip and Pelvic Problems in Athletes. Operative Techniques in Sports Medicine, 2007; 15:195-203. Kurtz S, Kocagoz S, Arnholt C, et al. Advances in zirconia toughened alumina biomaterials for total joint replacement. Journal of the Mechanical Behavior of Biomedical Materials, 2013, http://dx.doi.org/10.1016/j.jmbb…. Wilson M, Villar R. Hip replacement in the athlete: is there a role? Knee Surg Traumatol Arthrosc, 2011; 19:1524-1530. Ross J, Brown T. Return to Athletic Activity Following Total Hip Arthroplasty. The Open Sports Medicine Journal, 2010; 4:42-50.